Last week in a fit of health-filled exuberance, the Husband declared Mondays “Raw Food Monday”. Now, I know this man and I knew the look I would get if on Monday evening I brought him a nice pile of crudités. It would be the look of “well this is tasty, but where is dinner?” I think an important part of being in a relationship is understanding what your partner really means when they say stuff like “Let’s have Raw Food Mondays”. In my relationship, it means, “I’m feeling like I overindulged on the weekend and would really like to eat healthier”. So, without saying a word, when Raw Food Monday came around, I set to work making this Purple Kale and Farro salad. Filled to the brim with leafy greens, whole grain farro, zucchini and tomatoes, I knew it would check all the healthy boxes and be filling as well even it if didn’t fit the qualifications of “raw food”. As normal, around dinnertime on Monday, the Husband asked “what’s for dinner?”. “A salad” I replied. He immediately looked pretty bummed out, but then cautiously asked what kind of salad I had made. When I replied “farro salad” you would have thought he’d hit some kind of jackpot! “YES!” he cried, fist pumping in the air! So, maybe the Husband likes farro salad a little more than the average man, but this salad is such a hit–so loaded with goodness, that I know you will love it as well. We had this salad twice this week. For “Meatless Monday” (which is our normal practice) we had this salad with raw spinach. I made it again during the week with purple kale because I was taking some to a dear friend who is in the hospital and I wanted to choose greens that were a bit sturdier and could be refrigerated and eaten the next day. 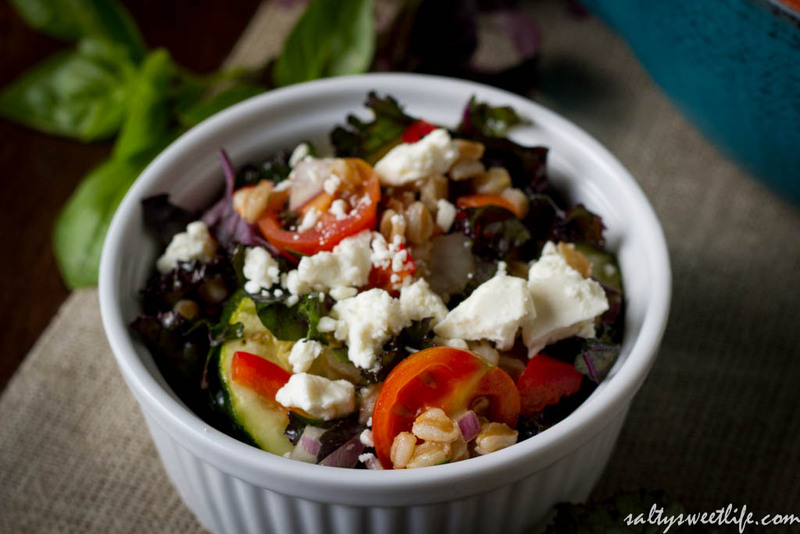 You can easily make it vegan by omitting the feta cheese and by cooking the farro in either vegetable broth or water. I was frustrated to discover that my local Whole Foods Market stopped offering farro in their bulk section, but they do sell it in their packaged grains section. 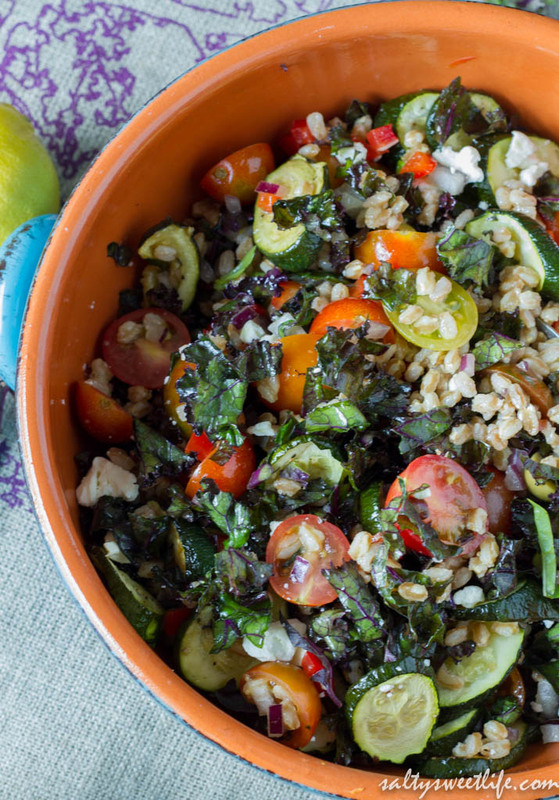 For this recipe, use “pearled” farro. It cooks in less than 30 minutes and does not require soaking overnight. In a medium saucepan, bring the broth to a boil, then add the rinsed farro. Allow the farro to come to a boil, then lower the heat and simmer, covered for 30 minutes or until all the liquid has evaporated. While the farro is cooking, slice the zucchini into rounds and place on a baking sheet. Drizzle with olive oil and lightly season with salt and pepper. Bake in a 400 degree oven for 15 minutes, then remove the pan and set it aside. While the farro and zucchini are cooking, prepare the remainder of the vegetables and the vinaigrette. Chop the kale into small pieces and place into a mixing bowl. Drizzle the kale with a little olive oil and sprinkle with a pinch of salt. Massage the oil and salt into the kale to tenderize it, and set it aside. Zest the lemon and add it to the kale. Juice the lemon into a small bowl and whisk in the dijon mustard, a pinch of salt, black pepper and agave syrup. Slowly whisk in the olive oil and taste. Add more salt and pepper if needed. Spread the cooked farro along the bottom of a large salad bowl and allow it to cool for about 5 minutes. Add the diced onion and stir into the farro. 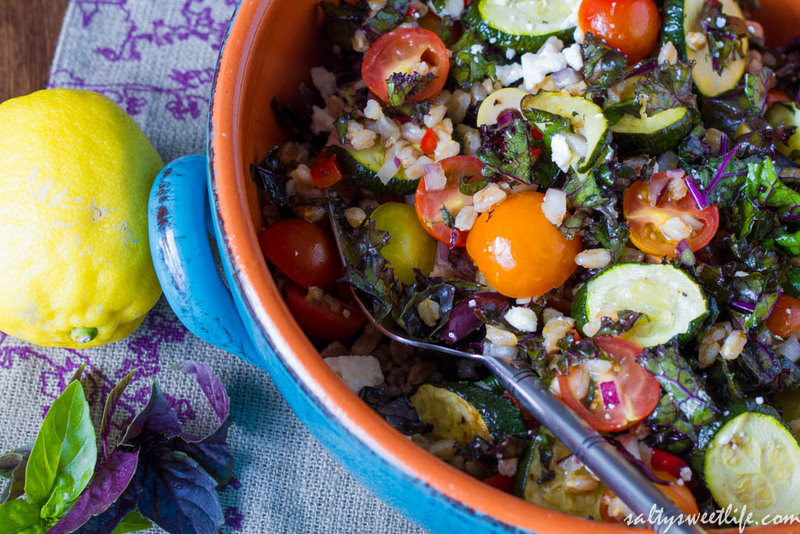 Add the zucchini, peppers, olives, basil, tomatoes and the kale to the farro and gently toss to combine. Pour the vinaigrette over the salad and give it a quick stir. Top with crumbled feta cheese if desired. I love it — fist pumps for farro! 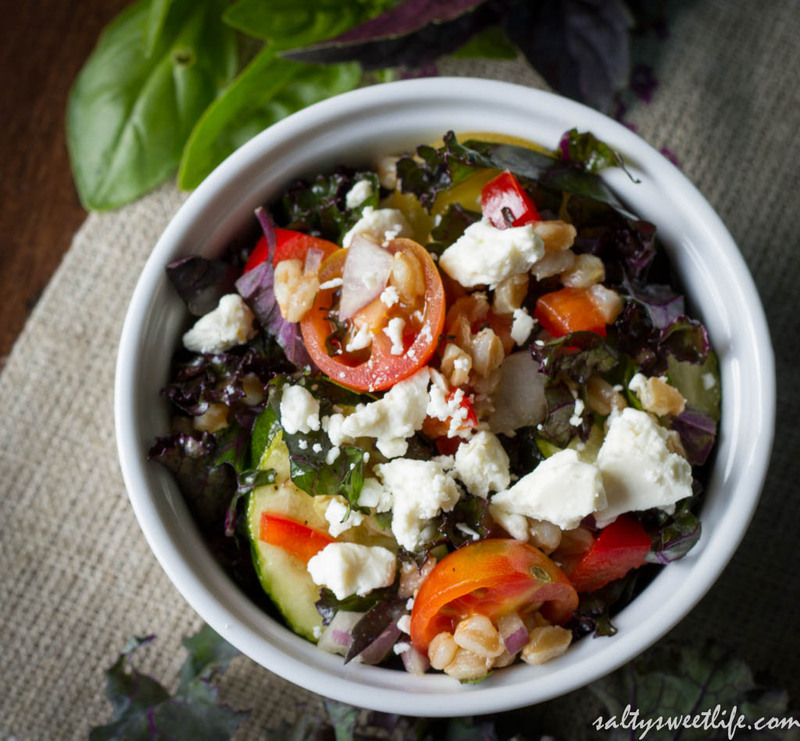 My husband loves a farro salad, too…very funny. This looks beautiful and delicious! Aw! Thank you for stopping by, Ali! It’s crazy how much he loves it! It’s such a favorite in our house! This looks so delicious, Tracey…definitely my kind of salad! Love the ingredients and the lemon vinaigrette…thanks for sharing! Jodee, thank you so very much! And thank you for sharing this recipe on social media! Means so much! Hope you are having a great night! And the pictures came out exceptional! Thank you Dana! I’m so glad you liked it and thanks for the compliment on the photos! 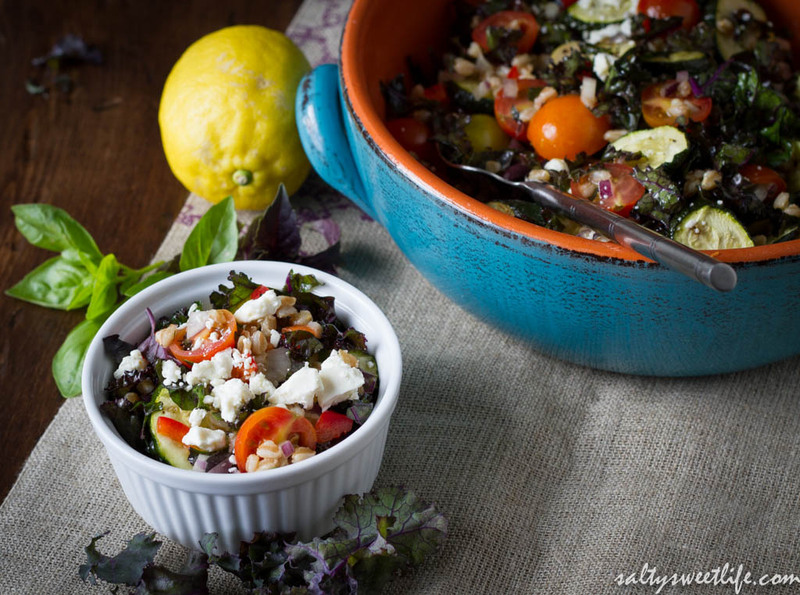 Kale salads are so challenging to photograph (at least for me they are)! We love farro too! This will be great for a summer evening. I might have to put in some shredded chicken to get a fist bump though. LOL! Too funny! The second time we had it, I topped it with some seared tuna! I’m glad to know that you love farro, too! It really is our favorite grain these days! Thank you Barbara! I really appreciate your wonderful compliment and I’m glad you enjoyed the recipe! Have a great weekend! This looks fantastic. I would love to eat this for a meatless meal. Thanks for sharing on The Weekend Social. Thank you so much for stopping by Erlene!! Goodness this looks delicious!! What a great summer salad! This looks so tasty! I still have not try Kale… What am I waiting for :). You are definitely convincing me with those pictures! Thank you so much Melanie! Kale is so versatile and healthy too! Wooohoo! Thank you for the nomination, Dana! It is such an honor! I’ve been away from the blog for a couple of weeks because of travel, but I’m so excited to pick it up! I hope I do you proud! You do, you certainly do 😊.I can’t wait to see what you write up in your acceptance post!! As delicious as this looks, my husband wouldn’t fist pump the air for any salad. I think we have a long way to go with this one. I think I could feed him kale or farro for dinner, but never both kale and farro. This looks great for leftovers for lunch the next day too. That’s so funny! Well, keep on trying–he might one day surprise you! The salad keeps very well and is awesome for leftovers!